At Automechanika this year in Birmingham, Leadec has been promoting the success of its recently commissioned wheel and tyre assembly operation in Coventry. The company exhibited its two wheel and tyre assemblies produced at its new £5m facility in Torrington Avenue. Previously wheel and tyre assembly had been carried out for 30 years a few hundred yards away in three separate buildings with a total capacity of 97,000 square feet. The new facility brings all operations under one roof with 150,000 square feet – an increase in capacity of more than 50%. 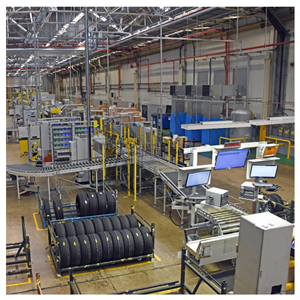 A new technically advanced 90m assembly line completes a wheel and tyre assembly in only 12 seconds compared to 20 seconds at the old facility. The new track, which includes ten fully-automated work-stations, is programmed to assemble every single possible combination of over 700 wheel and tyre derivatives currently with the capacity for 1,000. It is the only plant in the UK that can handle wheel sizes between 16-24”, and can produce 2.5 million assemblies a year on three shifts. “The new operation has been developed to meet the growing demand from premium and luxury car brands, such as Jaguar Land Rover, as well as for volume car manufacturers such as Vauxhall,” said Adam Hart, Leadec’s business Development Director. Leadec was awarded JLRQ, a top Quality award from Jaguar Land Rover, for its wheel and tyre operations. The award was formally presented in 2015 following assessments over a 12-month period on a range of criteria including its quality, delivery, technical ability, and planned preventive maintenance programmes. The company already holds the stringent automotive assembly quality standard, ISO/TS16949.